- most holes are around 100 feet, longest might be 200. - despite the course being in it's own little part of the park there were still lots of pedestrians and random people just wandering around. Other Thoughts: Fun little course for a beginner or for someone to practice their short approach shots on. Pros: Quaint course follows a creek in a narrow City park. Short holes but you can safari it to make them harder, Shady, peaceful park, easy access from highway. Holes 3 on are worth the play. Cons: A fair amount of people walking which makes the course harder to play, lots of kids in the way people sitting on benches. Holes 1-2 are really short and open. Other Thoughts: Play hole one from across the street- which is where you park in the other park. Now this is a great little pitch and putt! Pros: -An extremely fun little pitch and putt course that was apparently designed by the Boy Scouts of America as a youth course. As a result, all of the holes are right around 100' feet with the exception of a couple of the holes that are closer to 150'. -There is a small creek running through the course that you cross over twice. You are only forced to throw over the creek once (on hole #6 i believe). But, if you prefer it you can also play the third hole over the creek. I do it this way as it adds about 60 feet to the shot and makes the angle a little bit more challenging and fun. There is a steep little hill directly behind the basket that acts as a great backstop, along with a mature old tree in front of the basket, which make this a fantastic little ace-run. I think it is the best shot/hole on the course (when played from over the creek). -While there are a lot of trees in the park, the trees don't overwhelm the players on any of the holes. There are a few holes for sure (especially #9) that force the player to take the trees into consideration and shape their shot accordingly. -Being such a short course it is a great course to go and get aggressive on. For newer disc golfers Santa Anita will be your best place to take some serious ace runs. -I have played Santa Anita at least 5 or 6 times now, always around 12-3pm (both midweek and on the weekend) and I have never seen another disc golfer out there. I have had the course all to myself every time I've been to Santa Anita. There have been walkers, joggers, and people having picnics, but never once another disc golfer. -Because I have always had the course to myself I have been able to use the course more as a little practice facility than as an actual golf course. Instead of playing a legitimate round and keeping score I instead bring out all of my putters and approach discs (leaving everything else in the truck) and throw every disc on each hole, trying all the different throws and angles. Doing this has really helped my game and helped better familiarize me with the putters and approach discs in my bag. -You can come out and play a quick 9 holes in all of about 20 minutes, making this a perfect lunch break course if you work in the area. When I go to Santa Anita I'll usually play 27 holes (3 loops), throwing 5 discs off of every tee, and still get out of there in a little over an hour. -Being such a short course there is no need to carry your bag around here. I recommend that you just grab a handful of your discs (putters and approach discs) out of your bag, and then go out and enjoy your walk in the park. -The park and course are in immaculate shape. 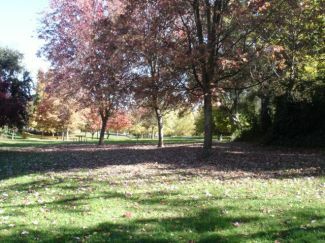 The park is very well manicured with thick green grass and mature trees growing throughout. -It pains me to say anything positive about our local government, but the city really does do a good job maintaining this park. Not only is it very well manicured, with a really nice walking path, but it has also been completely free of trash on all the visits I've made to the course/park. -There are trash cans and benches throughout the park. The trees provide ample shade, so it's a nice place to sit and relax after a round of golf. -One of the very best courses I have ever seen for young golfers and beginners that are older as well. If you have a youngster that wants to get out of the house, go buy him/her a couple of frisbees and bring him/her out to Santa Anita Park. They will be hooked! Cons: -The tee boxes are rather simple. Instead of concrete tee pads Santa Anita uses a wood board set in the grass/dirt to mark the tee box. Behind the board the grass have given way to hard packed dirt. While this may seem like a big negative, it really isn't. Being that most golfers will be throwing just about every shot with their feet set and planted at Santa Anita, the more natural tee boxes work out really well. I was actually using the edges of the wood boards (they come up about 8 inches off the ground) to plant my front foot against. -Most of the course plays right along the main park pedestrian path. Being that the course is scenic and in such great shape, it does attract some walkers. It by no means is overcrowded, but you will have people out on the pathways walking while you play. So, because the course plays right along the pathway you will have some waits while people are walking by. -Like others have said: the park has a lot more room which could have been used to lengthen the course. At the very least it could have been used to make a few of the holes quite a bit longer. It's a long and very skinny park, so there isn't a ton of room, but there is definitely enough to have a couple 300-400' holes. You can still use the baskets and play your own course that you make up in your mind. I've done that a lot here, making a couple of the holes quite a bit longer. Other Thoughts: -While the course is in Santa Anita Park you actually park your car in the lot directly across the street in Howe Park. Then you take the little cross walk across the two lane road to the first hole. The two parks are all of 15 feet away from each other. Because of this your car is parked super close to the tee on #1 and the basket on #9. -Santa Anita is exactly what a super short pitch and putt course should be. Even though you are really only throwing little 50% up-shots for most of the holes, you are having a blast doing it. -The location of the course is awesome. It is centrally located in Sacramento, which makes it super easy and convenient for people living in the city to get to. Its minutes away from Sac State, East Sacramento, Arden Fair Mall, Arden Arcade, Midtown, Downtown, and North Sacramento. Cons: Way too small to be considered a real course. It annoyed me that there was a long huge opening on one end of the park where they could have made a legit hole, but they didn't. Pros: Great surroundings. Quiet. Creek runs through it. Cons: No restrooms. Crosses pathways and people are walking quite often in the way. Other Thoughts: Nice course to work on point, shoot, release, accuracy and mechanics. No need to bring anything but your putters or a speed 3 disc. The creek comes into play on baskets 1, 2, 5 and 6. The creek portion near basket 1 tends to be dry and a non factor every time I played there. Use your hyzer on basket 2 and the creek is not going to be a problem. Basket 5 is 156 feet and a skinny tree in your path. Hyzer your shot between the basket and just to the left of the walkway. Be careful not to put too much on the shot or it may end up rolling into the creek. Use a disc, like a Rhyno, that will sit where it hits. Don't hit the tree branches that are just in front of you on tee pad 6 or your disc may end up in the creek. Tee pads are dirt patches with a 2 X 4 marking the front of the tee pad, tee pad 3 has no 2 X 4. Bring your Disc Gator, Disc Retriever or water shoes just in case your disc goes in creek. For Sacramento residents or people that know the Sacramento area: The course is located on Bell Street, midway between El Camino Ave and Cottage Way, across the street (sometimes referred to as behind) from Howe Park. Easy to access using public transportation. 1) Route 87, get off at/across from Howe Avenue Elementary School then walk to Howe Park. Walk east, towards the back of the Park, then cross Bell Street and you're there. 2) Route 23, get off at Bell Street and walk south on Bell (towards and past the church on the corner) about 5 minutes and the course is on your left. Pros: Shady, grassy park that makes for an enjoyable short course. Water winds through the course, although it's not much of a hazard, given the short hole lengths. Cons: This is a practice course for an experienced player, as all the holes are very short. Nearby backyards on each side of the course keep the drives conservative by necessity. Other Thoughts: If the water had been made a larger part of the hazards, my rating would be higher. Pros: Perfect for us newbies. The baskets are open with little obstacles to contend with. Good for putting. Nice clean park. Good for walking and enjoying the day. Cons: The kids that ride through here are on the bad side. Dont let your disc stay on the walkways. They go out of their way to run over or move your disc. Pros: Amazing, there's no horse manure anywhere. Oh, this isn't that Santa Anita? What this is is an almost perfect little pitch and putt course with holes length ranging from just over 100 feet to 150 feet. It's a pretty little grassy park, with mature trees providing shade and with a creek running through it. The trees are seldom in play except on maybe # 9. The baskets are DGA with orange tape on them. The pads are natural with just a front board which works just perfectly here. The hole # is stenciled on the board. This is just the ideal course for kids or beginners. The holes, although short, are well designed and feature some fun little ACE ops. Three rounds in an hour would be easy and with little hustle, you young guys could probably squeeze four into your hour. The park is litter free and very well maintained. Cons: Other than it being short and just nine holes, I don't find any Cons with this little course. Other Thoughts: I see a niche for these types of courses in our sport. There were four groups playing here this morning during the time I played my three rounds. If I lived close, I'd drop by constantly just for the ACE ops. I might actually get one to stick eventually. Pros: Very pleasant atmosphere. Well landscaped. Trees provide shade. Each hole is different. A good balance of reasonable challenge, but not too much frustration. Basically, it's fun. It's a beginners course, and for that it is perfect. Cons: Pedestrians walk along trail that winds through the park. Sometimes you have to wait for them to get out of the way. Once in a while inconsiderate people have picnics or birthday parties right on the fairway when they could easily do so in the park across the street. :-p Garbage cans aren't emptied all that frequently, and sometimes stink really bad. Hole 5's basket is mislabeled as 6. Hole 6's basket is missing its label. There are no actual tee pads, just dirt with toe boards. But you don't really need them, as you won't be x-stepping to throw these short distances. Other Thoughts: This is the park where I started playing, and still the one where I play most often. Some of the other area parks, like John Mackey, are more challenging in terms of throwing distance, but few are as pleasant as this one. Mackey for instance, is kind of dried up and wide open. While this park is lush and green. And the holes are quite well designed to be interesting. It's a joy to play.